With every failure, you are one step closer to success. With every “no,” you have moved nearer to the long-awaited “yes.” With every setback, you take a step forward toward a break through. Often, the greatest insights and most profound nuggets of wisdom stem from failure. Yet, there are few takeaways in a string of successes. By its very nature, the optic of success rarely shares the failures it required. Defeats are regularly swept under the rug with the implication that they somehow detract from the win. What if you were to reframe failure? What if you were to redefine it? What if you thought of failure as a pathway to progress to what you desire most? 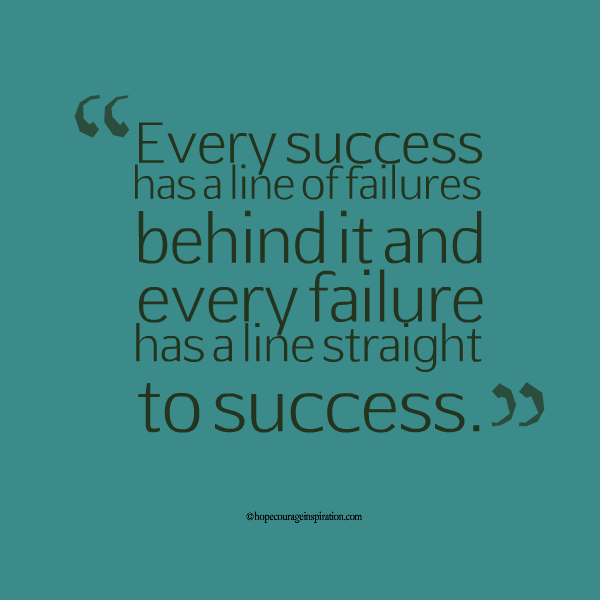 Every success has a line of failures behind it and every failure has a line straight to success. Learn from your missteps and put them to work for you. Don’t make the same mistake twice and never give up. Pick yourself up and choose to make tomorrow better. You have the ability and the choice is yours. Redefine failure so that it is a stepping stone to the success you envision and act every day to bring yourself closer to your goals.